I have added masking tape to secure it to the window so it does not get blown off in the storms we are having off & on this week & last. I know I spoke of the nest somewhere but I could not find it when I looked just now, so I will do this instead. I got this photo one of the times "Momma" left the nest. Last edited by JunieGirl; Apr 30th, 2016 at 07:03 AM. That is precious...thanks for sharing. you have to pay attention to the time stamps on the photos. Very sweet. Are you avoiding using that door? Yes we are avoiding using the front door. We use the garage door. I often carry the opener with me when I am out with other people. I would avoid that door also. yea I understand that, Tina. I sleep anywhere from 6 to 8 hrs. a night & yet I am tired a lot of the day. AND I have a sleep number bed, so I can adjust the firmness if it.. but oh well it is what it is. OMG, that is adorable....thank you so much for sharing. Will you keep the wreath there next year? I discarded last years wreath. 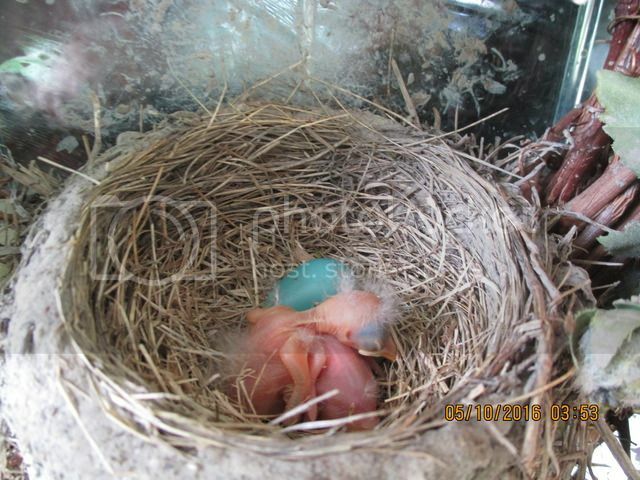 That was sad b/c when the birds form last year came back to build a nest once again. 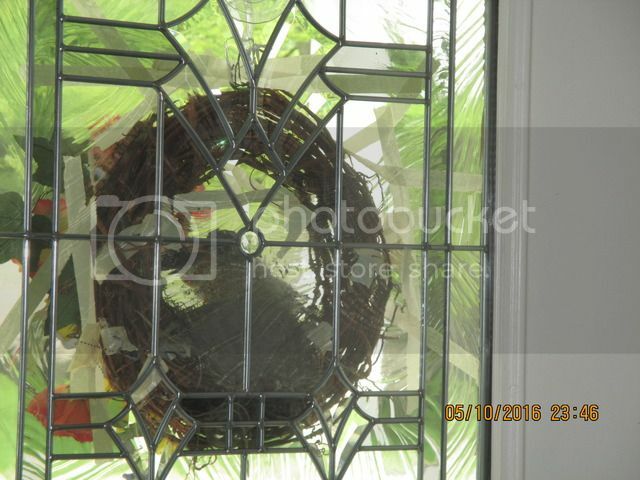 They were smaller, (sparrows) and they could not deal with the gap between the wreath & the window & they left. 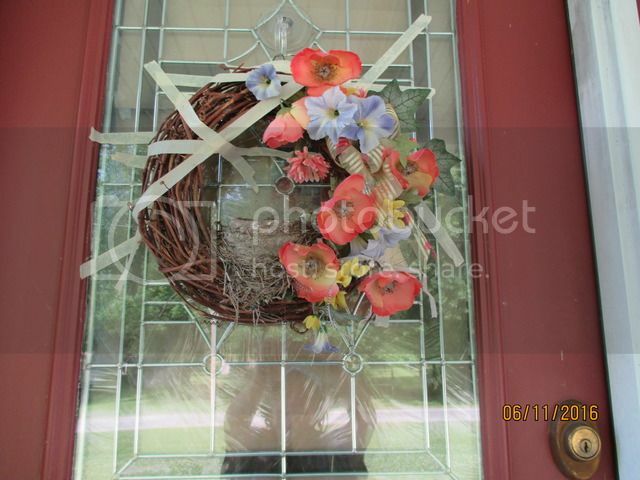 Momma Robin did not mind the small gap, & so used this wreath anyway. 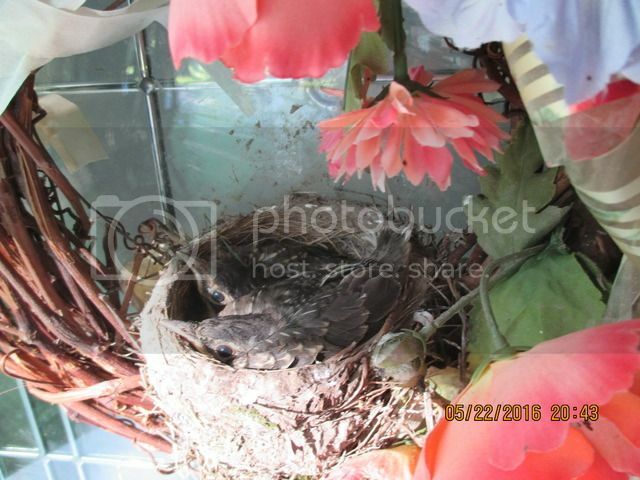 I will remove the nest & keep the wreath to put back next spring. You've got babies every where! Are these babies flying yet? No these babies are not flying yet--but I expect it any day now---Mom is having a hard time sitting on them at night to keep them warm. Below is the photo I took of the 2 baby birdies that I took minutes after their sibling flew off, to begin his/her adventures. 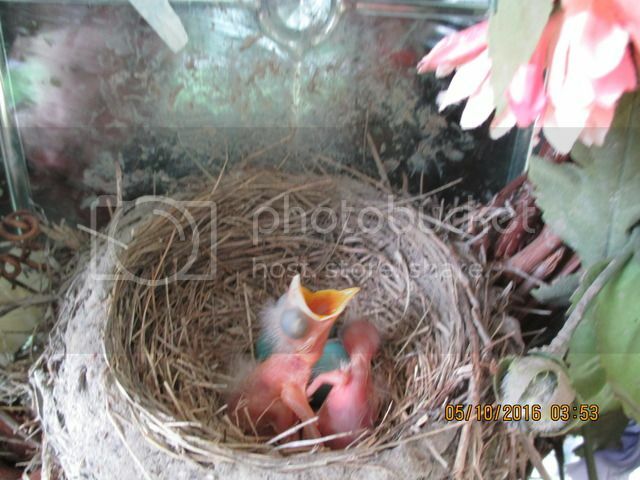 Then 2 days later on the 24th (yesterday) I went to see how they were doing & I startled them (my bad) & they (first one then the other) flew off. So, today I washed off the front porch steps & such. 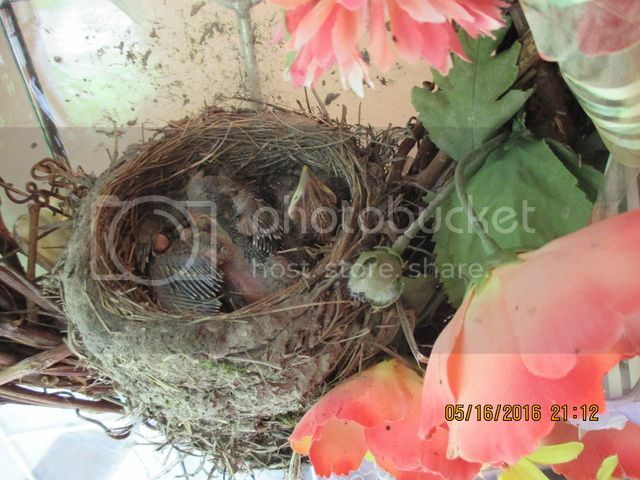 I left the bird nest up as I want to show it to my Grandsons that are coming to visit in a few days. They are so cute. Bye-bye, birdies. 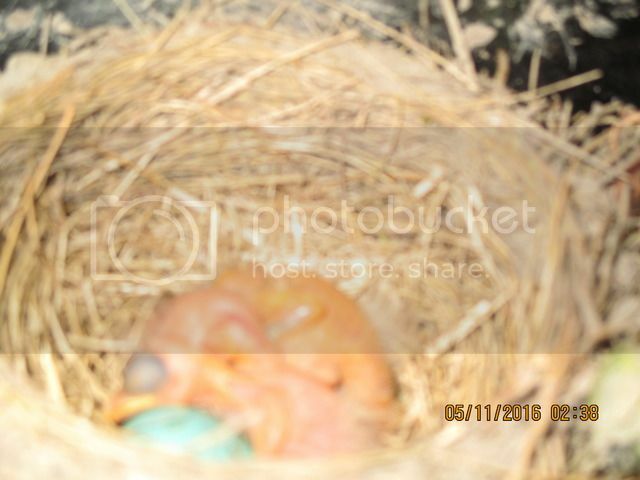 Tuesday (5-31-16) Momma bird came back & is prepping her nest for the next brood. She picked out the first layer of the nest & is redoing the lining. I had looked up to see if she would do that...some posted said absolutely NOT & some said they had 1 Robin using the same nest since 2013. So, I thought to give it a week before I took this one down. (although I did clean up the porch & door in the week she was not around.) And, yes she came back. IF this is the same Mommy Robin she is sure skittish this time around. She flys off at but a shadow. So, I put the brown paper back up on the inside of the window for her a few days ago. 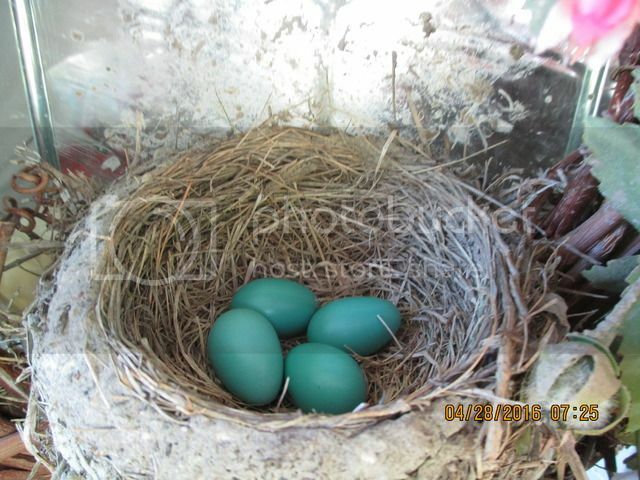 Well, today I peek under the paper, I see nothing, but then oops, she flys away--(she must have been scrunched way down in the nest)...so I then went out to get the mail & went up on the porch to look & there is one pretty blue Robin's egg. Momma had better come back soon. PS: The other time we could walk by or look in the nest & the Mom seemed not to care....this one does not even like to see a shadow. Spooks easily. But a wonderful thing to see. Yes it is..and thankfully there was enough time between broods that I was able to wash the front door & steps. I took the opportunity to snap a picture. 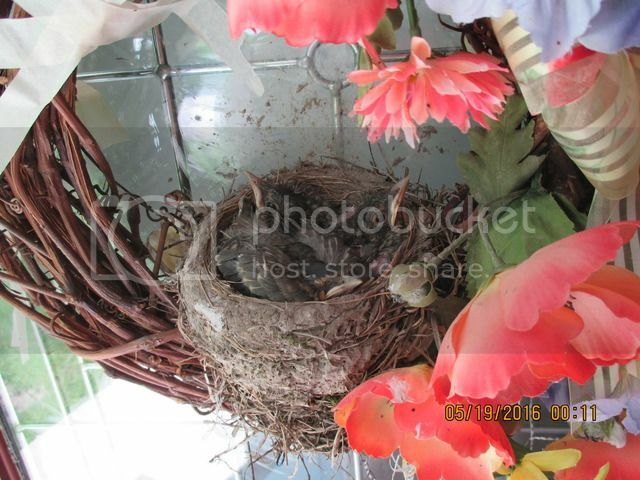 b) so the storms we were having would not blow away the wreath & nest. 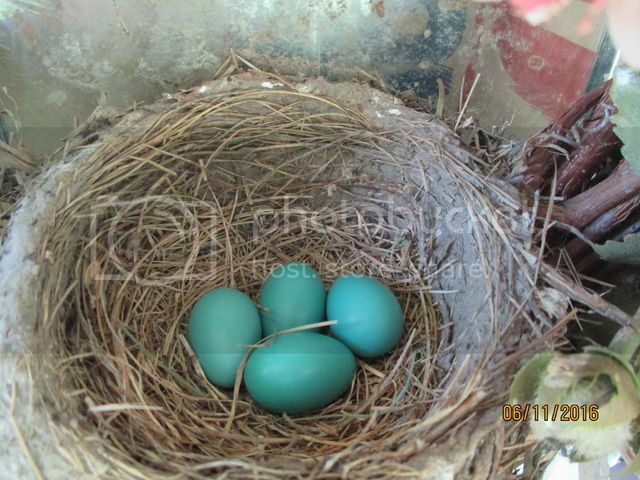 Robin eggs are a beautiful color. You're a good foster grandmother to them. I was speaking to Rodney tonight and he says the latest brood of birdies are gone now. Two broods is enough. I hope for more for future broods. I love the color of the eggs.